It seems that Ubisoft forgot to include the Uplay Passport codes needed for multiplayer action in the Xbox 360 retail release of Driver: San Francisco. Oh, Ubisoft. It's almost at the point where I'd actually start to feel sorry for you, if your efforts to impose DRM on everything in sight weren't so loathsome. Instead, I'll settle for a vague sense of bewilderment at your preternatural talent for botching the job, which has manifested itself most recently in the Uplay Passport multiplayer codes that were meant to ship with the recently-released Driver: San Francisco but, for reasons currently unknown, did not. 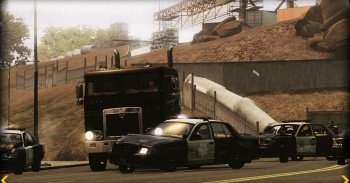 Driver: San Francisco is the first game to incorporate Ubi's Uplay Passport scheme and while the European launch of the game on September 2 went off without a hitch, the retail version of the Xbox 360 version in NTSC regions - which is to say, North America - includes a Uplay Passport code to unlock DLC but not the multiplayer mode. Because of that, those who purchased the game only have a 48-hour trial period to play the game online. And what's Ubisoft going to do? The publisher told Joystiq last night that it would release a statement today to "clear everything up in regard to the Uplay Passport codes and Driver: San Francisco," but so far nothing more has been forthcoming. And while it's not a complete train wreck yet - the trial period gives Ubisoft a window of opportunity to fix the problem with no harm done - it is kind of amazing how Ubisoft manages to keep tripping over its own DRM feet. It's like a curse or something. We've reached out to Ubisoft about its plans to remedy the situation and we'll let you know what we hear. UPDATE: And this is what we hear. Ubisoft will be providing the Uplay Passport for Driver: San Francisco free, to all players worldwide. The company explained the situation with the following statement. Due to a printing error on the insert of some copies of Driver: San Francisco in North America, Ubisoft has elected to provide the Driver Uplay Passport content for free. Although this problem does not affect players outside of North America, we have decided to mirror this offer worldwide in order to be fair to all our players. 2. Select Purchase Uplay Passport, which will be provided at no charge. Either option will unlock the 11 multiplayer modes and the Film Director feature on console titles with Uplay Passport.